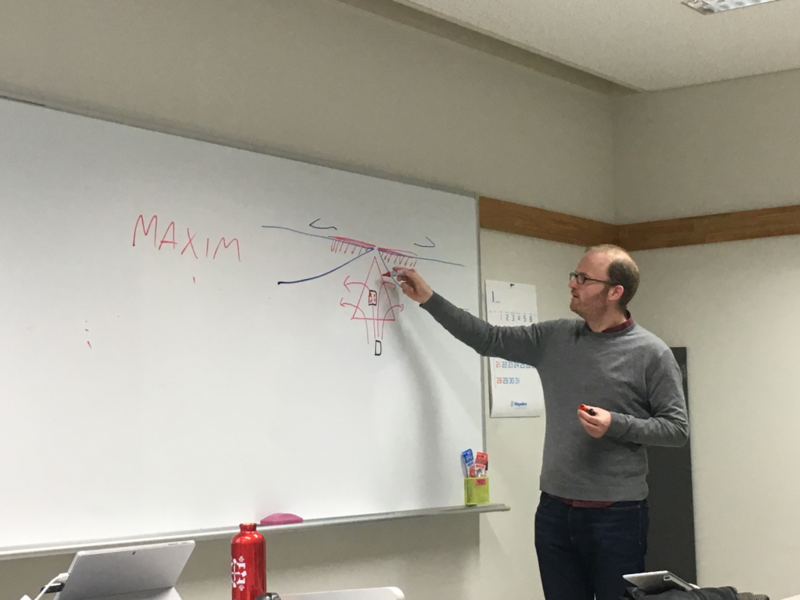 Dr. Maxim D. Ballmer (ETH, Switzerland) gave an international lecture at the University of Tokyo, School of science (2018/1/17-19). Five students from the department of Earth and Planetary Science and department of Astronomy had the opportunity to learn about geodynamical simulations of mantle convection, with a focus on mantle plumes. The students could apply what they learned during the practical session of the course, during which they simulated thermochemical convection using a Matlab code provided by the professor. Course Objectives This course will provide the theoretical background of mantle convection on terrestrial planets, teach the basics of numerical modeling of fluid dynamics with solid-Earth applications, and also give examples of how to test numerical-model predictions with geological, geochemical, and geophysical observations. The goal of this course is to understand the objectives and potentials of numerical modeling, as well as to learn how to program a simple isoviscous thermo-mechanical model using finite-difference discretization. Basic knowledge of a programming language is desired but not necessarily required.